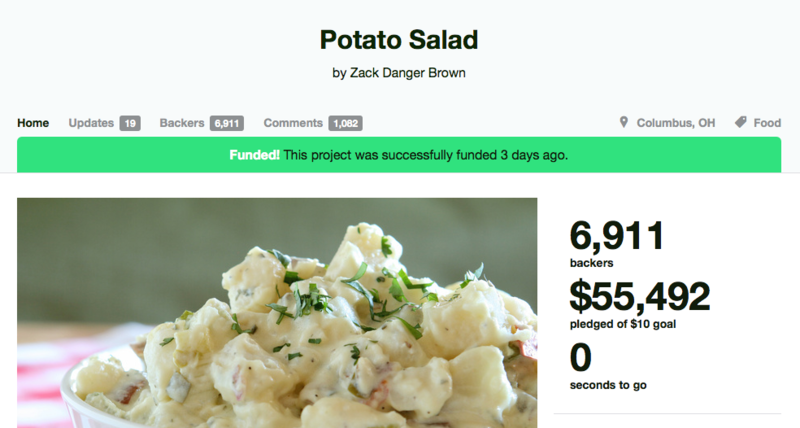 I am sure by now you have heard about the Kickstarter project from Zack Brown where he promises to make potato salad. In a bowl. In his kitchen. That’s the project. For this he raised more than $55,000 from nearly seven thousand backers from all over the world, including more than 20 “platinum” sponsors. 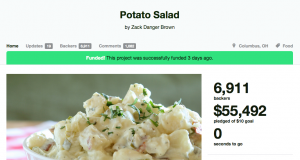 The project became big potatoes — it was the fourth most-viewed page on Kickstarter, right behind the Veronica Mars movie and the Pebble watch, with more than four million views. Many of the contributions were small — backers averaged $8 per pledge, compared with a Kickstarter-wide average of $78. Maybe because it was something so goofy, or so simple (the project didn’t have a video intro), or just because it was so incredible. When I was interviewed about crowdfunding for our local TV station a few weeks ago, I mentioned his project on the air. Brown’s potatoes became a big deal, he got thousands of media mentions that just fed his project even further. What started out as a big joke turned into a serious effort, and now he is talking about starting a foundation and building a humor-oriented website. And Columbus, Ohio, where he is based, is holding a street festival called PotatoStock that will feature food, music, and fun. I would call it a hash bash. So what can we learn from this meme? Here are a few suggestions. If you want to make something to share with others, maybe you just need ten or 20 or 50 people to get your idea off the ground. That is from one of the conclusions from Kickstarter central, and I think it is a good one. Brown’s original goal was to raise $60, and he quickly passed that. Hyperlocal is best. The Internet is great for spreading the word, surely and he got funds from all over. But Brown’s project picked up a lot of backers from the Columbus area, which is one of his reasons for holding the PotatoStock event. The project is still about one man, one kitchen and his condiments. Sometimes you don’t need that next Big Idea. While there certainly have been some fascinating crowdfunded projects, the simple ideas also have their place. Yes, it would be one thing if Brown was going to take his 55 large and head off to Tahiti, or wherever. But he seems humbled by the experience. Perhaps his foundation can pay it forward and nourish another idea, or add some additional humor into our lives. Humor helps. Under the risks section, Brown is very forthcoming: “It might not be that good. It’s my first potato salad.” His update videos are hilarious, and others have used humor to describe his efforts, all in a goodhearted way. We are surrounded by too much gloom and doom that having some humor helps. The real lesson to be learned is that the Internet is a great way to distribute humor and that humor and good feelings are a very valuable commodity. Laughter and positivity are what make our lives good. So eat a little potato salad, enjoy a good laugh, and share it with others on the Internet!